In June 1960, The Belgian Congo became independent of Belgium, and was renamed omitting "Belgian". Independence proved to be chaotic and unstable, civil war erupted with the two main factions being supported by the USA and USSR in opposition. The United Nations mounted a peacekeeping operation, which was not above criticism. As the richest province, Katanga, with its natural resources including copper cobalt and uranium, declared itself as a separate state. This secession was led by Moishe Tshombe, supported by the Belgian owned mining company and an army of European mercenaries. In The Congo, Joseph Mobutu lead a military coup which overthrew the communist backed Prime Minister Patrice Lubumba. By 1963, the dream of an independent Katanga was over and it was renamed Shaba or Shabasa, and the capital Elizabethville was renamed Lubumbashi. Meanwhile in 1961 Katanga issued a gold proof 5 francs. In its brief period of independence, Katanga only issued two denominations of coins in 1961, 1 and 5 francs in base metal, and a gold version of the 5 franc coins. The obverse design consists of a large bunch of bananas, quite a rare symbol on any coin. On the large flat raised border is ths single word KATANGA, and two knife symbols, which may represent knife money. 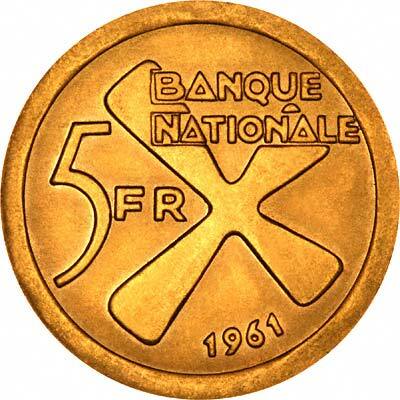 The reverse design is a large "Katanga cross", and the inscripion 5 FR BANQUE NATIONALE 1961. A Katanga cross was a form of ancient money used in this area from about the tenth century until about 1920, and called "handa". They varied in size and weight, but typically were about 8 inches across, and from about half a pound to 2 1/2 pounds. They were cast by pouring molten copper into moulds made in the sand. A typical cross One cross was worth ten kilos of flour, five fowls, three kilos of rubber or six axes. In addition to their use as a medium of exchange or currency, they also served as regalia, raw material, insignia and emblems. Gold Content = Gold content in Troy Ounces. 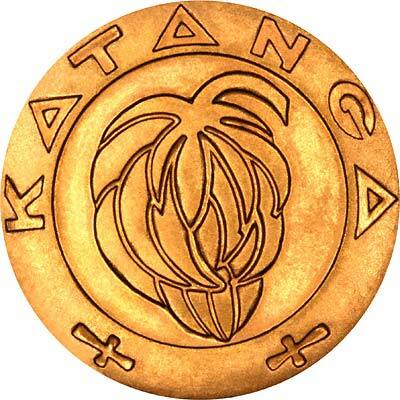 For silver and base metal coins of Katanga, please look at our original Chard Coins website.